The final announcement from Valve this week has hit, and boy does it look weird. 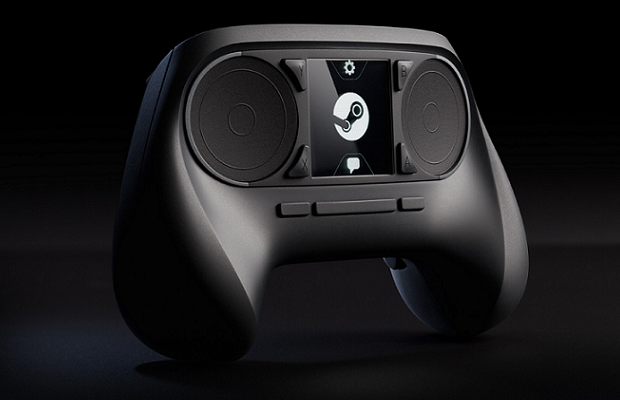 Continuing the trend of living room focused announcements, the studio has revealed the Steam Controller, pictured above. The most striking features of the controller are the dual trackpads which replace the joysticks found on more traditional gamepads. According to the description from the official reveal, the goal seems to be a controller which translates much more fluently from keyboard and mouse. Driven by the player’s thumbs, each one has a high-resolution trackpad as its base. It is also clickable, allowing the entire surface to act as a button. The trackpads allow far higher fidelity input than has previously been possible with traditional handheld controllers. Steam gamers, who are used to the input associated with PCs, will appreciate that the Steam Controller’s resolution approaches that of a desktop mouse. Also new is what Valve is calling a “new generation of super-precise haptic feedback.,” which is basically a fancy term for high-tech rumble. It also features a touch screen, which looks to function similarly to the one found on the PS4. All of this information is a bit difficult to parse at this point, especially without having any firsthand experience with the controller itself, but it does sound interesting. Check out the default controller configuration for Valve’s Portal below for a better understanding of where everything is. Don’t worry about signing up for any additional betas, as the lucky few who get an early version of the Steam Machine will also receive the controller.